Backgammon is an ancient game with a long history all over the world. This article talks about backgammon's origins, different versions, variations in rules according to locale, and many other facts of this wonderful game which is still developing. Backgammon is believed to have originated in Mesopotamia in the Persian empire or present day Iran, Iraq, and Syria. It is the oldest known recorded board game. Backgammon was typically played on surfaces such as wood, using stones as markers, and dice made from bones, stones, wood, or pottery and it can be traced back thousands of years to board games played by the Egyptians, Sumerians, Romans, and Persians. Throughout history, backgammon has been associated with the leaders and aristocracy of these ancient civilizations as shown by excavated relics and literary references from Persia, Greece, Rome, and the Far East. 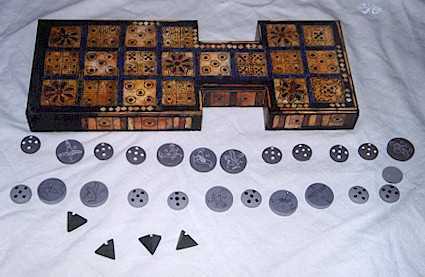 Gaming boards with 3x10, 3x12, and 3x6 squares were found in Egypt and it was known as the Game of Thirty Squares or Senat. 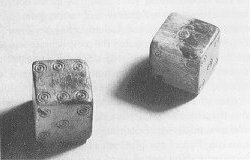 These artifacts date back to 3000 to 1788 BC and the rules as well as the use of dice for this game remain unknown. Wooden boards were found in the royal tomb of the Ur al Chaldees, the center of Sumer dated around 2600 BC along with tetrahedral dice and are known as The Royal Games of Ur. A set of rules for the game played at that time was found on some cuneiform tablets dated at about 177 BC. The Romans left evidence of a game called Ludus Duodecim Scriptorum, "The Game of 12 Lines," with leather boards and sets of 30 markers, 15 of ebony and 15 of ivory dating back to 600 AD and is thought to be derived from the Egyptian Senat. In the 1st Century AD Ludus Duodecim Scriptorum was replaced by a variant with 2x12 lines instead of 3x12 lines, as it grew closer and closer to today's version of backgammon. Backgammon came to Britain with the Roman conquest in the 1st Century and was also referred to as Tabula, a generic name for the board on which it was played. This pastime was quite popular and a favored game by Emporor Claudius. About 50 AD, Claudius wrote a history of the game of Tabula which, unfortunately, has not survived. His imperial carriage was equipped with an alveus, a Tabula playing board, so that he could play while travelling. Tabula is also the game which was primarily responsible for the gambling mania which swept Rome prior to its being declared illegal under the Republic. The fine for gambling at any other time except the Saturnalia was four times the stakes, although this law was only weakly and sporadically enforced. By the 6th Century backgammon was called Alea, "the art of gambling with dice". Alea was likely the first precursor to contemporary backgammon although there were many variations regarding starting positions and movment. The board represents a year; each side contains 12 points for months of the year; the twenty-four points represent the hours in a day; the 30 checkers represent days of the month; the sum of opposing sides of the die represent the 7 days fo the week; the contrasting colors of each set of checkers represent day and night. T'shu-p'u was the Chinese name for Nard, thought to be invented in Western India and ariving in China during the Wei dynasty (220 to 265 AD), popular from 479 to 1000 AD, while the Japanese called it Sugoroku. Nard introduced into Europe via Italy or Spain following Arab occupation of Sicily in 902 AD. The term Tabula was used by several cultures, making it likely that the game was spread by the Roman Empire while Nard was similarly spread thoughout Asia by the Arabs. The Arabian game Nard appears to be a slightly modifed version of Tabula, perhaps incorporating aspects of Egyptian Senat. The main difference between these two old Backgammon games was that Tabula used three dice while Nard used two. The use of two dice for Tabula later became increasingly popular. The first mention of backgammon in English print was in The Codex Exoniensis: "These two shall sit at tables ..." in 1025, as Tables was played throughout the middle ages and was popular in English taverns. Chess overtook Tables in popularity around the 15th Century. Backgammon was even banned for some time due to its prevalent gambling nature until the reign of Elizabeth I. In fact, Backgammon enjoyed popularity in several countries under different names, including: Tavola Reale (Italy), Tables Reales (Spain), Tavli (Greece), Tavla (Turkey), Tric Trac (France), Backgammon or Tables (Britain), Puff (Germany), Vrhcaby (Czech), and Swan-liu (China). The term Backgammon is said to have been derived in 1645 from either the Saxon baec (back) gamen (game) or the Welsh bac or bach (little) gammon or cammaun (battle), with the first being more likely. Yet another theory was that it received its name because it was frequently found on the "back" of chessboards, although this too is unlikely. By this time Tabula using two dice and adopting the rule of playing doubles twice was much like the contemporary version of backgammon with the exception of the doubling cube and the counting of gammons and backgammons. 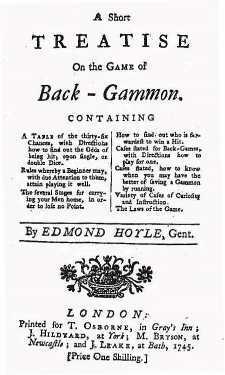 In 1743 Edmond Hoyle codified the rules of play with his Treatise on Backgammon, the first official set of modern rules in existence. The doubling cube was believed to have been introduced in New York in the 1920's by some unknown gambler, which enhanced the element of skill in the game increasing its marketability, insuring its place as a popular pastime. Backgammon was mostly limited to the upper class in private clubs, although several introductory backgammon publications burst onto the scene. The rules of backgammon were modified in 1931 in the U.S. to what generally governs the game today. There was somewhat of a decline in popularity during the depression and a light resurgence in the 1940's which saw a few more texts published although no real advances in skill. Interest decreased again during WWII. The popularity of backgammon increased during the 1960's with the efforts of Prince Alexis Obelensky (Oby) who organized and promoted tournaments and the first "Official" World Championships in the Bahamas becoming backgammon's highest honor which holds true today. A prolific publishing trend of backgammon books started with Backgammon: The Action Game" by Oby himself. The 1970's have been frequently described as backgammon's "Heyday" as it saw huge increases in popularity, publicity, tournaments and backgammon literature including books, magazines, and newspaper columns. It moved from the upper to middle classes and was popular among the younger generation as well. 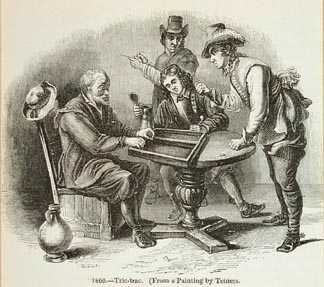 Tournament purses soared into six-digit sums and backgammon popularity was widespread throughout the US and Europe. Several great introductory texts came out including The Backgammon Book, by Jacoby and Crawford, Backgammon: The Cruelest Game, by Cooke and Bradshaw, Backgammon for Profit, by Dwek, and the classic Backgammon, by Magriel, referred to by many as the "bible of backgammon". The 1980's however saw a decline in popularity again, mostly among the younger generation, likely due to the advent of video games and the excitement to young minds that they can provide. Interest in learning the intricacies of the game was as strong as ever for the players that remained and was bolstered by the invention of computer backgammon which could not only provide a decent opponent but more importantly could save hours of time by performing rollouts of positions, giving players a deeper understanding of backgammon game. The computer revolution continued in full force as Gerald Tesauro of IBM wrote software which could teach itself how to play backgammon using Neural Networking, creating a world class player in TD-Gammon. FIBS (First Internet Backgammon Server) was created in 1993 by Andreas Schneider and hosted on an academic computer in Sweden for free. Over 100 players with Internet connections could be found playing at any one time with the ability to save matches, watch matches and compare playing strengths via a rating system. Frederic Dahl of Norway created the first commercial neural net backgammon software, Jellyfish, which could assign equity values to any position and rollout positions like never before. Bot players appeared on FIBS and a backgammon newsgroup appeared at rec.games.backgammon, where players could go and discuss all things backgammon. Olivier Egger introduced Snowie, a more commercially popular backgammon software with a user-friendly interface and the ability to import and analyze matches still considered todays standard. The latest development in backgammon game software, GNU Backgammon, will likely give these others a run for their money as it is based on Open Source, making it free for download and improvement by programmers. 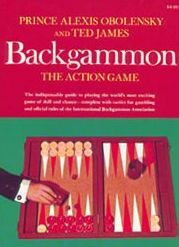 Several serious backgammon books appeared by the likes of Kleinman, Robertie, and Woolsey and our body of knowledge and use of backgammon software has become so advanced that most recent books describe concepts and positions backed up by computer rollouts such as those by Bagai (who actually corrects mistakes make in previous books) and Wiggins. Backgammon has acheived somewhat of a steady state, with several tournaments throughout the US and Europe being well attended. The Internet provides several backgammon servers which enjoy clientele in the thousands and the World Wide Web has given birth to a multitude of backgammon resources such as the one you are at now.